This is the beginning of our story. Check out the video below to find out how we got here. 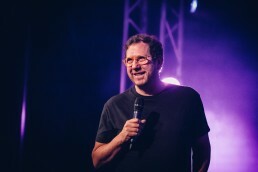 Affectionately known as P3, (Pastor Peter Prothero), Peter is the senior pastor of Equippers Church, a thriving local church with multiple Sunday services in four main locations, (Chertsey, Essex, Richmond and Weybridge). He is also the Director of the International Apostolic Bible College (IABC) in Kolding, Denmark, where he was a senior lecturer for eight years. In the U.K. Peter gives leadership to the monthly Acts pastors gathering, (Acts Churches Europe) and travels extensively, both in Europe and beyond, training leaders and strengthening local church networks. Peter is married to Jacqui and they have six adult children. Our vision is to win souls, make disciples, transform communities and transform nations. We've wrapped our core values around the letters H-E-A-R-T. They are what drive us and keep us beating.